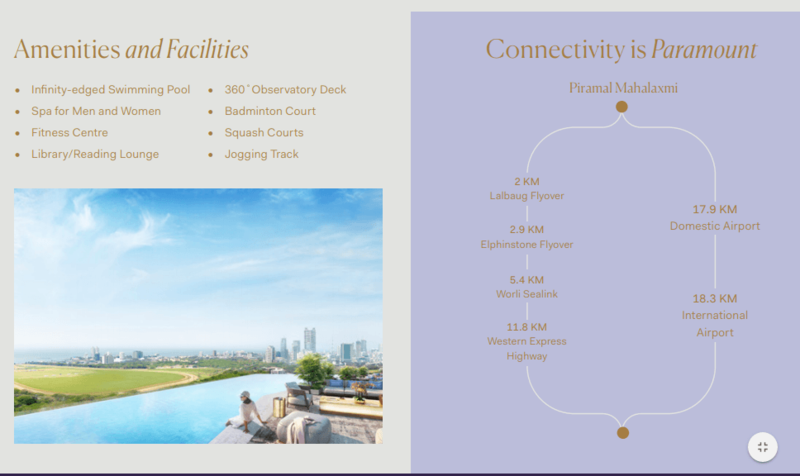 Piramal Mahalaxmi is one of Mumbai’s newest contemporary developments. Its sheer magnitude and magnificence comprises three breath-taking skyscrapers with exceptional amenities. What defines Piramal Mahalaxmi is South Mumbai’s purpose, influence and resolute ambition. It is the ultimate reflection of sophistication, culture and luxury. The South Tower shines as a new beacon, showcasing Lifetime Views of the 225-acre Mahalaxmi Racecourse, the Arabian Sea and the city’s expansive Harbour. Towering over the Mumbai Skyline, the South Tower rises up to 63 storeys and offers affordable & luxurious residences, each uniquely designed to maximise views and redefine luxury living.